Locals in Gilgit Baltistan have filled the streets in demand for the immediate release of political activist Baba Jan, who remains in jail despite his recent acquittal by the Hunza Court. 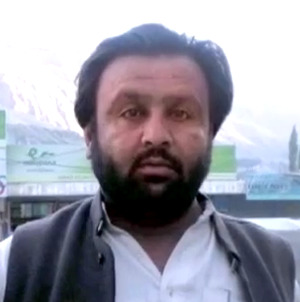 Imprisoned since August 2011 for raising awareness about the rights of those having been displaced following the climate-change induced landslide on the Hunza River in 2010, Baba Jan faced charges and life imprisonment. As many other activists in the region, Baba Jan was arrested for denouncing injustice and state oppression, and his detainment reflects the many human rights abuses faced by people in Gilgit Baltistan. Although other political activists’ and his case were raised many times before on the international stage, the government of Pakistan continues to mistreat people under Schedule-IV of its Anti-Terrorism Act. Protests are being held in Pakistan occupied Kashmir's (PoK) Gilgit for the immediate release of political activist Baba Jan, who was recently acquitted by the Hunza Court in a case brought by the state of Pakistan against him but wasn't released from the prison. The case was filed against him for raising the issue of illegal allotment of marble mines to Chinese companies in Nasirabad valley of Hunza. The locals in Gilgit Baltistan hit the streets to demand Baba Jan's immediate release from the jail. "My mother has asked me to put this question before all sisters and mothers of Hunza and Gozal as to why her son (Baba Jan) was arrested. What was his crime? You all have your children at your homes but I am dying to meet my son," said Baba Jan's sister Nazreen. The General Secretary of Awami Worker's Party Dr. Bakhshal Thalo also raised his voice in solidarity with the jailed activist and asserted that Baba Jan is not one person but everyone represents Baba Jan. He said, "I want to say this on the floor of the anti-people establishment that Baba Jan is not a single person. Each one of us is Baba Jan. Each comrade is echoing the same phrase." The former President of Supreme Appellate Court Bar Association, Gilgit Ehsan Ali revealed that all the cases against Jan are bogus. "All of Hunza is a testimony to the fact that Baba Jan was not present there but the police and administration implicated him under false charges. They forced policemen to become false witnesses and give false testimony in courts. Policemen were either threatened with their professional career or were lured by promotions in order to give false testimony. However, the highest court of Gilgit dismissed the case calling it bogus," he said. Baba Jan and two other youth activists from Hunza, Amir Khan, and Iftekhar Hussain, were convicted in August 2011 by an anti-terrorism court for participating in a mass movement against the inaction of the government during the Attabad incident. The protesters were seeking compensation for the loss of their property in the wake of a landslide that hit Attabad on January 4, 2010, killing 19 people, blocking the Hunza River and forming a 23 kilometers long lake that submerged three villagers upstream in Gojal, rendering around 500 people homeless and 25,000 stranded.